In this guide, you will learn how to implement a "Login-with-Facebook" authentication workflow with Graphcool and configure permission rules to control data access among your users. For the frontend, you're going to use React & Apollo Client. The first thing you need to do is download the starter project for this guide. Before you can start with the actual implementation of the React app, you need to create the GraphQL server your app will run against. You'll create the server using the Graphcool CLI. Now that the CLI is installed, you can use it to create the file structure for a new Graphcool service. You're passing server as the directory name to the init command, the CLI will also create this directory for you and put all generated files into it. graphcool.yml contains the [service definition]](!alias-opheidaix3) with all the information around your data model and other type definitions, usage of functions, permission rules and more. When working with Graphcool, you can easily add features to your service by pulling in a template. A Graphcool template is nothing but the definition of another Graphcool service. When running graphcool add-template <template>, the CLI downloads all the code from the corresponding GitHub directory and adds the functionality from the template as comments to your graphcool.ym and types.graphql files. For this tutorial, you'll use the facebook authentication template that implements the "Login with Facebook" flow. Notice that graphcool/templates/auth/facebook simply corresponds to a path on GitHub. It points to the auth/facebook directory in the templates repository in the graphcool GitHub organization. This directory contains the service definition and all additional files for the Graphcool service that is your template. The most important parts for now are the service and type definitions. The service definition defines two resolver functions. The first one, facebookAuthentication is used for the signup and login functionality. The second one, loggedInUser allows to validate whether an authentication token belongs to a currently logged in user in the Graphcool API. You'll take a look at the implementations in a bit. The type definitions simply define the User type that you'll use to store user data and represent authenticated users. As mentioned above, the add-template command downloads the code from the GitHub repository and adds it as comments to your configuration files. In order to "activate" the functionality, you still need to uncomment the lines that were added by the CLI. Similarly, you need to uncomment the User type that was added to types.graphql. It's now time to deploy your service! Once deployed it will be available via an HTTP endpoint that exposes the functionality defined in graphcool.yml. You can deploy a service using the graphcool deploy command. Before deployment, you still need to install the node dependencies for your resolver functions. These are specified in server/package.json. When prompted which cluster you want to deploy to, choose any of the Backend-as-a-Service options (shared-eu-west-1, shared-ap-northeast-1 or shared-us-west-2). The command outputs the HTTP endpoints of your GraphQL API. Notice that it also created the local .graphcoolrc inside the current directory. This is used to manage your deployment targets. In addition to the User that you got from the facebook authentication template, you also need a type to represent the posts that your users will be creating once they're authenticated. Here's what the corresponding model looks like. The author-field represents the one end of the one-to-many relation between the User and the Post type. This relation represents the fact that an authenticated user can be the author of a post. After every change you're making to your service definition, you need to redeploy the service for the changes to actually take effect. Here's what the generated output looks like. ├── +  A new field with the name `description` and type `String!` is created. └── +  A new field with the name `imageUrl` and type `String!` is created. + The relation `UsersPosts` is created. It connects the type `Post` with the type `User`. This reflects precisely the changes we mentioned above. The "Login with Facebook" authentication works in the way that your app will be receiving an authentication token from the Facebook API that proves your users' identities. In order for this flow to work, you need to first create a Facebook app. Follow the instructions in the Facebook documentation to create your own Facebook app. Once your app was created, you need to enable Facebook Login and configure it with the right information. Select Facebook Login in the left sidebar (listed under PRODUCTS) and add the following URLs to the Valid OAuth redirects URIs: http://localhost:3000. The Facebook SDK is already contained in the starter service, it's loaded asynchronously using a script inside componentDidMount of the App component. However, you still need to configure it with the information about your particular app. Open the Dashboard in the sidebar of your Facebook app and copy the App ID as well as the API Version into App.js. Set them as the values for the two constants FACEBOOK_APP_ID and FACEBOOK_API_VERSION which are defined on top of the file. You're finally getting to the point where you can turn your attention towards the frontend. The first thing you need to is add the dependencies for Apollo Client. Next you need to instantiate the ApolloClient and configure it with the endpoint of your GraphQL API. The ApolloClient is your main interface to the GraphQL server and will take care of sending all queries and mutations for you. The last thing you need to do is replace the __SERVICE_ID__ placeholder when calling createNetworkInterface. Then copy the value for serviceId and replace the __SERVICE_ID__ placeholder from before. The first three steps are of the authentication flow are effectively taken care of by the Facebook SDK, it's now your task to add the required functionality on the Graphcool end. Step 4 stays you need to call the authenticateUser(facebookToken: String!) mutation with the token that your received from Facebook, so that's what you'll do next! By using Apollo's higher-order component graphql, you're "combining" your React component with the authenticateUser-mutation. Apollo will now inject a function called authenticateUserMutation into the props of your component that will send the given mutation to the API for you. The last thing you need to do to make the authentication flow work, is actually call that function. That's it, the Facebook authentication now is already implemented. If you run the app and then click the "Login with Facebook"-button, a new User will be created in the database. You can verify that in the Graphcool console or a Playground. In the app, you want to be able to detect whether a user is currently logged in. A very simple way to do so would be to simply check whether localStorage contains a value for the key graphcoolToken, since that's how you're storing the authentication tokens after having received them from your API. Notice however that these tokens are temporary, meaning they'll eventually expire and can't be used for authentication any more. This means that ideally you should not only check whether you currently have a token available in localStorage, but actually validate it against the API to confirm that it's either valid or expired. For exactly this purpose, the ƒacebook template provides a dedicated query that you can send to the API, with an authentication token attached to the request, and the server will return the id of a logged-in user or null if the token is not valid. You want this information to be available in the root of your application, that's the App component. Apollo's compose function allows to easily inject multiple queries and mutations into a single React component. Whenever the App component now loads, Apollo executes the loggedInUser query against the API. So now you need to make sure that the result of the query is used accordingly to render the UI of your app. If the query was successful and returned the id of a logged-in user, you want to display a logout-button as well as a button for the user to create a new post. Otherwise, you simply render the same UI as before with the login- and signup-buttons. Notice you're specifying the fetchPolicy when you're adding the loggedInUser query to the App component. This is to make sure that Apollo actually executes the request against the API rather than looking up a previous result in its cache. Lastly, to also account for the ongoing network request, you should make sure to render a loading-state as long as your users are waiting for a response from the server. This is all the code you need in order to implement the logged-in status. However, when running the app you'll find that despite the fact that you are already logged in (at least that's the case if you've create a new user before), the UI still looks as before and doesn't render neither the logout-button, nor the button for the user to create new posts. That's because the token is not yet attached to the request, so your GraphQL server still doesn't actually know in whose name the reuqest is sent! To attach the token to the request's header, you need to configure your ApolloClient instance accordingly, since it is responsible for sending all the HTTP requests that contain your queries and mutations. With this setup, Apollo will now make sure the Authorization header of your HTTP requests contains the auth token. To display all posts, you simply need to send the allPosts query to the API and render the results in a list inside the ListPage component. That's it! Your app now fetches all the posts and renders them initially. The last bit of functionality that's needed in the app is the feature to add new posts. This will be implemented by using the createPost mutation which is part of the CRUD API that Graphcool automatically generates for your model types. const loggedInUser = // ... where to get the logged in user from? All right, this code will work but one detail is still missing! You need to have access to the currently logged-in user to be able to send the mutation (since you need to provide the user's id as the authorId argument when sending the mutation to the server). To get access to the currently logged-in user, you'll simply use the loggedInUser query again, in the same way you already did in App.js. 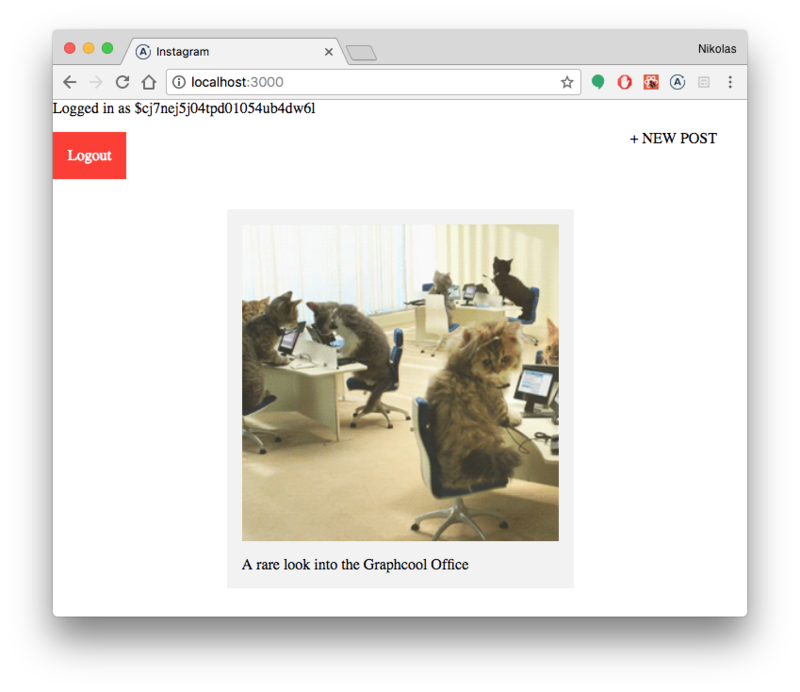 Creating a new post with the CreatePost component. The new post is now displayed in the ListPage component. All the features are now implemented, but wait - didn't we have more requirements for the app? We also want to secure data access and configure permission rules such that only authenticated users can create new posts, and only the author of a post can update or delete it. Right now, everyone who has access to the endpoint of your GraphQL server is able to perform these operations (despite the fact that the UI of your React app of doesn't allow this)! When using Graphcool, you need to explicitly allow your clients to perform the operations that are exposed by your API. But wait! If that's the case, why were you able to create and download posts before then? Shouldn't you have had to explicitly allow these operations then? The reason why the allPosts query and createPost mutation were already working is simple. When a new Graphcool service is created, there is a wildcard permission setup for you that does the job of allowing all operations. This simply expresses that all operations are allowed. If you remove this one permission and run graphcool deploy afterwards, you'll notice that all your queries and operations will fail with a Insufficient permissions error. To start with a clean slate, remove the - operation: '*' from the graphcool.yml file. The first permission you're going to add is the one to allow everyone to see posts. For the next permission to allow only authenticated users to create new posts, you'll make use of the authenticated property. This now expresses that users who are trying to perform the createPost mutation need to be authenticated. The second permission for UsersPosts is needed because the createPost mutation will also create a relation (which is called UsersPosts as defined in types.graphql), so the connect operation on the relation needs to be allowed as well. For these permissions, you need to make use of a permission query. Permission queries are regular GraphQL queries that only return true or false. If you specify a permission query for an operation, Graphcool will run the permission query right before the corresponding operation is performed. Only if the query then returns true, the operation will actually be performed, otherwise it fails with a permission error. Both permissions require the user to be authenticated, but they also point to a file that contain more concrete rules for these operations. So, you'll need to create these files next! Create a new directory inside server/src and call it permissions. Then create a new file inside that new directory, call it Post.graphql. Notice that the arguments $node_id and $user_id will be injected into the query automatically when it is executed. $node_id is the id of the Post node that is to be updated (or deleted), and $user_id is the id of the currently logged in user who's sending the request. Lastly, you need to make sure the changes are applied to your service. Awesome! Now the permission rules apply and all our initial requirements for the app are fulfilled! 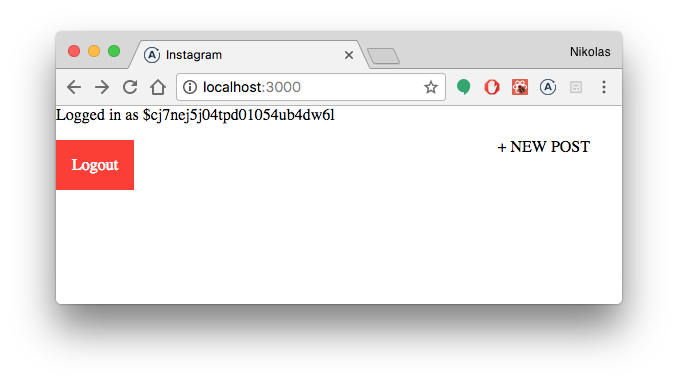 In this guide, you learned how to build a simple app using an Facebook-based authentication workflow. 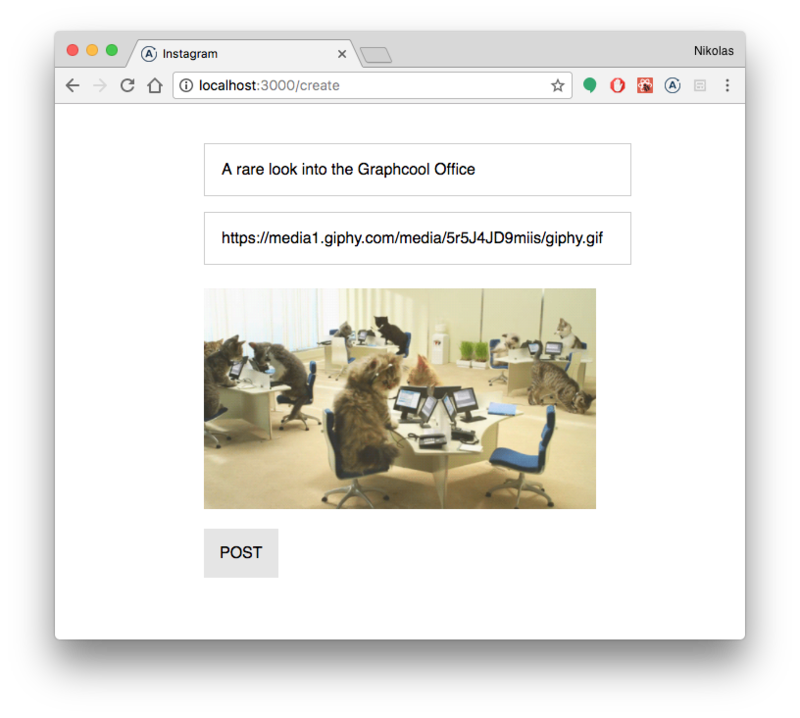 You created your GraphQL server from scratch using the Graphcool CLI and customized the facebook authentication template according to your needs by adding a relation to the Post type. You then configured Apollo Client inside your React app and implemented all required operations. Finally you removed the wildcard permission from the service and explicitly defined permission rules for the operations that your API exposes.